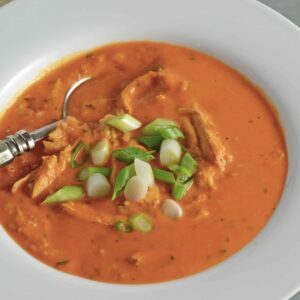 Roasted Red Pepper Soup is gluten and dairy free using hummus, roasted red peppers, pre-cooked chicken, and brown rice for a super quick and healthy soup! In a small food processor combine roasted red peppers and hummus. Blend until smooth. If you do not own a food processor you can finely mince (almost to a pulp) or use a stick blender directly in the sauce pan. Transfer to a medium saucepan. Add water through fine sea salt. As soon as the mixture comes to a boil, it is ready. Ladle into bowls, garnish with chopped scallions and serve. Serve with bread and mozzarella cheese if desired.